The British Formula One Paddock Club is the best Silverstone package on offer; nothing comes close to its luxury, glamour, or premium VVIP service. The package combines the very best viewing positions, directly above the pit lane, together with an open champagne bar and delicious, gourmet food. The Silverstone F1 Paddock Club Britain is the ideal way to spend a race weekend; optimum comfort, supreme hospitality, and terrific racing. A Formula One race weekend happens just once each year; make the most out of it by being at the epicentre of the drama. From your viewing suite above the teams, you can watch every move in finite detail, getting to grips with the magic of Grand Prix. From US$4,470 per person for Saturday & Sunday. Friday available at additional cost. In addition to being Formula One Paddock Club™ Official Distributors, we also have exclusive access to many of the F1 Team suites in Paddock Club. 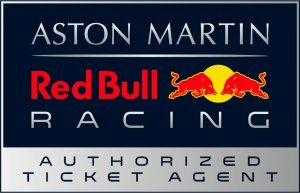 We are Authorized Ticket Agents for the Aston Martin Red Bull Racing F1 Team and in addition can also gain access to a number of the other top F1 Team Suites. Team garage tour: Exclusive behind the scenes look at the team’s garage and cars from inside the garage. Paddock tours: Mix with VIPs, celebs & stars in the Paddock and maybe enjoy a coffee in the team motor-home. Driver Q&A: On Saturday & Sunday before and after the racing with the opportunity to ask those burning questions and grab autographs. Team merchandise: Great F1 merchandise to commemorate the weekend. From US$5,150 per person for Saturday & Sunday. Friday available at additional cost.